If you’re mourning the absence of pizza from your healthy diet, you can stop now. Pizza can sometimes be grease-laden and heavy on the carbs. But not this version. 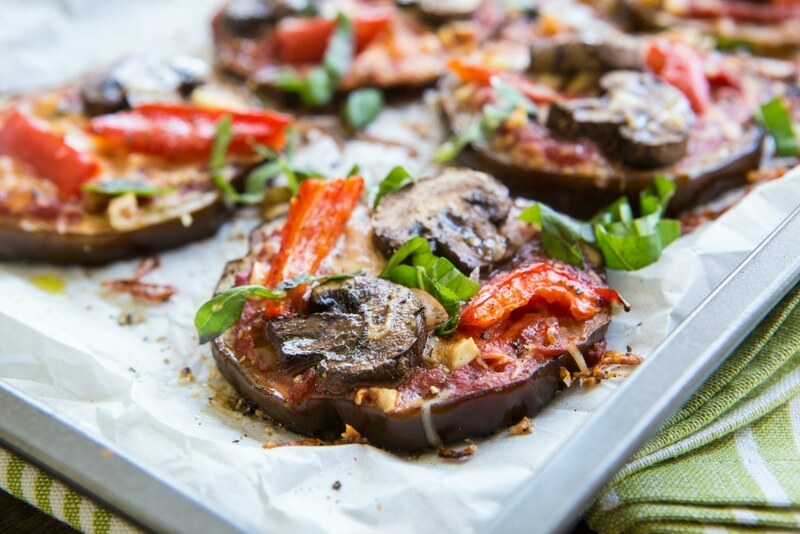 Since refined flour crust is devoid of beneficial nutrients and causes a spike in blood sugar, I created this good-for-you eggplant pizza recipe to replace the flour. 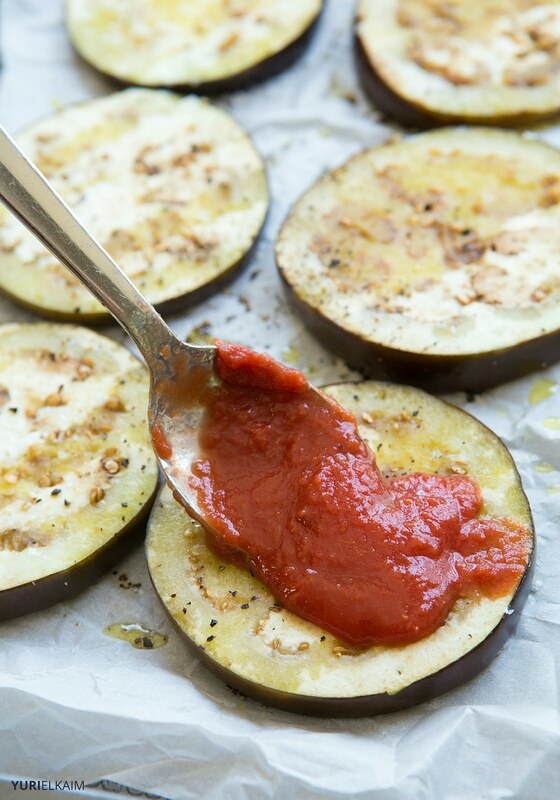 Eggplant makes a great platform for piling on your favorite pizza toppings. Plus, slicing into an eggplant is so much simpler than mixing up a batch of homemade pizza dough. You can easily make this eggplant pizza vegan (or purely paleo) by going cheese-free or using vegan cheese as a replacement. Peppers and mushrooms are traditional pizza toppers, but you can add any veggies you want to customize your healthy pizza. You might be surprised just how nutritious this dish is: keep your pizza as is and you’ll be getting plenty of lycopene and vitamin C for both cancer-fighting benefits and glowing skin. Even kids love these mini pizzas, and you can let them choose their own toppings for a fun pizza night. 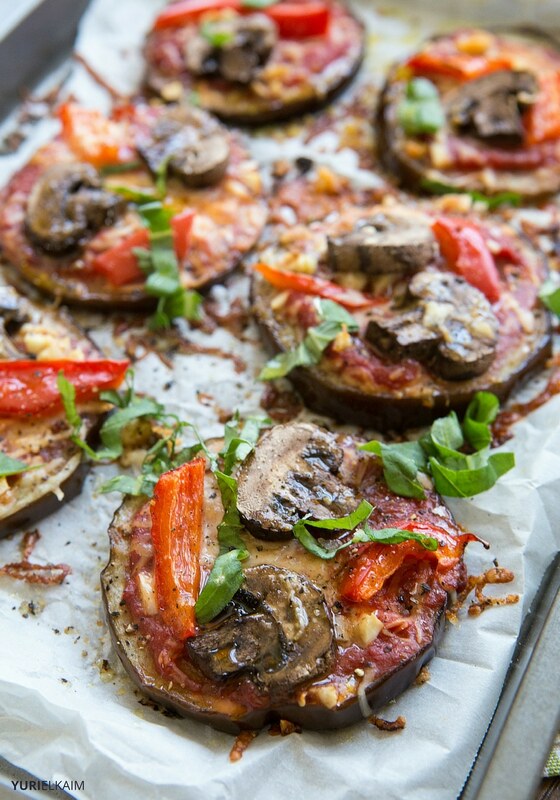 Any time a pizza craving hits, make these healthy eggplant pizzas instead. Eggplants get their beautiful purple color from anthocyanins, which are compounds with anti-cancer and anti-inflammatory properties. One compound in eggplants has been shown to protect the fats in brain cell membranes, which is a definite bonus! Line a baking sheet with parchment paper. Place eggplant slices on the baking sheet. Drizzle with olive oil. Sprinkle with salt and pepper. Roast in preheated oven for 15 minutes, then spread a small amount of crushed tomatoes on the top of each eggplant slice. Sprinkle with chopped garlic and cheese. Top with mushroom and bell pepper slices. Salt lightly. Return to oven and bake an additional 10-15 minutes, or until the cheese begins to bubble and turn golden brown around the edges. Garnish with fresh chopped basil. Serve and enjoy!